Pentereis are powerful vessels, the true foundation of any nation seeking the Thalassokratia. This is the true foundation of the Thalassokratia, Basileu! A fleet of mighty Pentereis is among the best our shipwrights can build. Although the fleet will be accompanied by some very large ships such as the hexerai and hepterai, those are fewer in number and usually serve as flagships. With ships such as these, your enemies will be crushed, and you shall be crowned by Nike! There have been numerous attempts to reconstruct the Pentere. Some scientists believe that it had 2 rows of oars manned (from the deck) Three-2, others state that 3 rows of oars are more probable manned either 1-2-2 or 2-2-1, while some even suggest a single level with 5 oarsmen. The three-level theory seems the most probable as we have information that the "5" was much higher than a "4". A single source mentions that it was possible to build a Pentere on the hull designed for a Tetrere. This is the main argument for single manned, probably open third level on outriggers - just as it was on Triere. Available information also suggests that "5"s were about the same length and width as "4"s - 37x6m. The crew consisted of 300 oarsmen operating 184 oars (in a 3 row scheme). The ship carried 40 marines but could accommodate 80 soldiers more, as it had full deck. 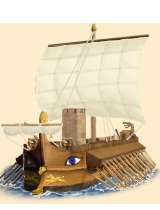 These ships were armed with ballistae of various sizes, but the ram was still main weapon. As with every Greek warship, it had sails that were used during longer voyages.